Bullying is when one person hurts, harms or is mean to another person over and over again. Some bullies may be mean by repeatedly tripping, hitting or pushing someone, while other bullies may leave a person out or not invite them to join games or group activities. A lot of bullies use texts or social media to send mean messages, sometimes over and over again. Bullies may act this way to make themselves feel better or more powerful than other people. Bullies may also act this way towards people they believe are different from other people. It is never okay to bully others for any reason. If you are being bullied or know someone who is being bullied at school or online, talk to a parent, teacher, counselor or another trusted adult. You and your friends can also stand up against bullying by speaking up when someone is being bullied, refusing to share mean and harmful messages about your peers and reporting bullying when you witness it. If I think I am being cyberbullied, what can I do? It’s often recommended that you ignore bullying messages instead of responding to them, but we know that’s tough! You can also unfriend bullies or block their messages or texts, so you don’t see them. Ignoring cyberbullying isn’t your only option, and you definitely don’t have to face it alone. It’s a good idea to get help from a parent, school counselor or another trusted adult. Save the messages, especially if the cyberbullying contains threats, so they can be reported to the proper authorities. Bullying is repeated behavior that hurts, harms or humiliates a person either physically or emotionally, and it can happen while at school, in the community or online. Active bullying is physically harmful behavior, like tripping, hitting or pushing, while passive bullying involves excluding a person from a group or social activities. Cyberbullying includes repeatedly sending hurtful or humiliating messages through text or social media. Almost half of South African Grade 9 pupils (47%) reported being bullied “about monthly” and 17% reported being bullied “about weekly” according to the Trends in International Mathematics and Science Study (TIMSS) from 2015. Learners may be bullied for a variety of reasons, including their physical appearance, sexual orientation, gender identity, race, religion or social status. Young people who are bullied may be more likely to have problems in school or experience sleep difficulty, anxiety or depression. The TIMSS Grade 9 country report revealed that pupils who reported “almost never” experiencing bullying scored higher for maths and science than pupils who reported experiencing bullying on a weekly basis. Young people have a unique power to prevent bullying. Some research estimates that 57 percent of bullying situations stop when a peer intervenes on behalf of a person who is being bullied. Parents and guardians can encourage their children to be upstanders by speaking up when someone is being bullied, refusing to share harmful messages about their peers and reporting bullying when they witness it. Talk with your child about bullying, so they know they can come to you for help if they or their friends are being bullied and make sure to provide them with support and validation of their experiences. If you hear about someone who is being bullied or is bullying other kids, broach the topic with your child while in the car. “I heard Tshego was sending messages that weren’t very nice to another kid at school. Did you hear about this?” This is just one way to begin the conversation. You can talk about how hurtful bullying is and how some people bully others to make themselves feel powerful. By asking what your child thinks about this, you can find out if they have experienced bullying and how they would handle it. This is also a good time to reassure your child that they can come to you if they are bullied. Young people have a unique power to prevent bullying. Some research estimates that 57 percent of bullying situations stop when a peer intervenes on behalf of a person who is being bullied. Educators can encourage their students to be upstanders by speaking up when someone is being bullied, refusing to share harmful messages about their peers and reporting bullying when they witness it. Educators should talk with learners about bullying, so they know they can come to you for help if they or their friends are being bullied and should make sure to take action when bullying takes place. 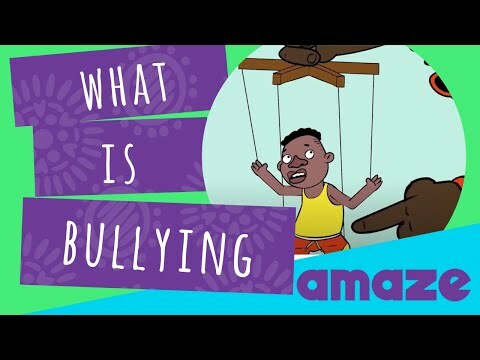 What are some examples of bullying that you saw in the video? How do you think it feels to be bullied? What would you suggest someone do if they are being bullied or left out? What would you recommend someone do if they witness bullying?